You may have already heard of or even played Fumito Ueda’s latest masterpiece The Last Guardian. For those who didn’t, it’s a PlayStation game that has been in active development for a mind-boggling decade. But last November it finally hit the shelves and with it came one of the most beautiful game soundtracks of recent times. Takeshi Furukawa’s original score covers the whole range. From the sensitive piano driblets that emphasize the touching relationship between the boy and the beast, to propulsive but never repetitive rhythm sections that drive you forward during the tense action sequences. Atop of that Furukawa wrote some staggeringly beautiful themes and lots of little motifs that really bring the ancient scenery to life. This whole musical bouquet is a memorable one and it’s slowly but steadily growing to be my most-beloved score of the year so far. I’ve warmed-up for this custom covers series by downloading the original font “Godlike” and turning some of the official key art into square custom covers (#3), if only to get into the mood. I’ve had some long-standing plans for this score, but it wasn’t until I found an upright fanart that really got this whole thing going. 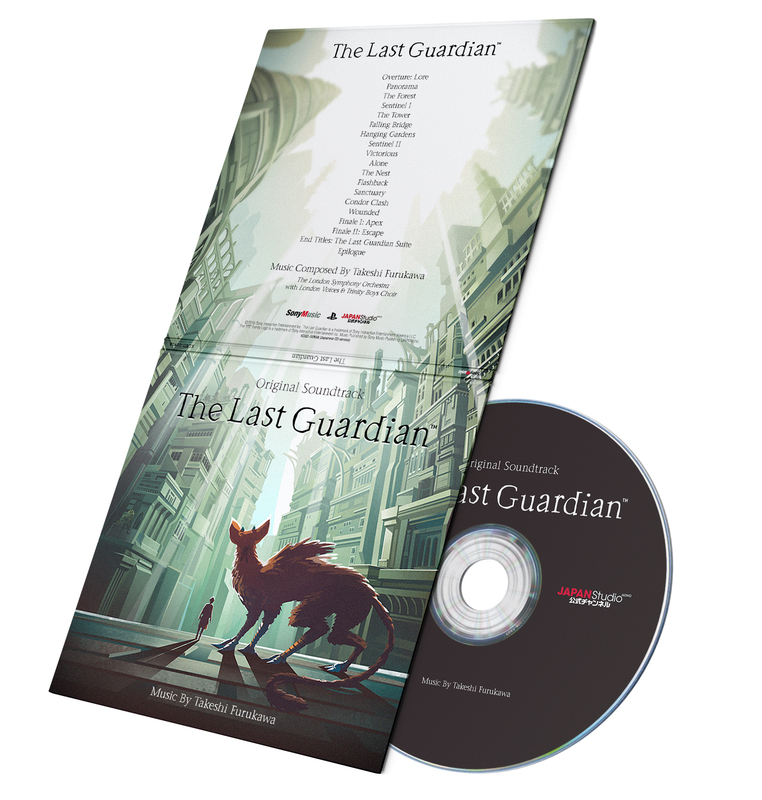 François Coutu’s tribute piece inspired me to come up with a special digipack design (#4, #5) and I really got lost in The Last Guardian all over again. Since my very first playthrough I wanted to make something out of the bestiary drawings from the haunting opening titles of the game. I ended up making my own TLG sigil using the font “Garamond Premier Pro Regular” and added a pre-existing, but very well-fitting eye symbol frame that I found on Google (#6). Also in the gallery above is the official Vinyl artwork from Iam8bit (#2), which I’m not entirely convinced of. Not artistically speaking, but thematically. For me it doesn’t transport the vibe of the game all too well. Even though its creator Nimit Malavia painted a lovely collage and even incorporated some clever key graphics from within the game into his design. I nonetheless would have preferred a warmer colour palette and maybe a different art style as well. I guess what I’m really saying is, this game is so utterly beautiful, why not use it to your own advantage? My initial plan for this series consisted of a series of covers similiar to what I have done for Fumito Ueda’s previous game, Shadow of the Colossus. Back then I came up with a different artwork for each single track of the soundtrack album. It worked quite well as a concept and so I decided to carry it over to The Last Guardian, the seemingly final part of the unofficial Team ICO trilogy. I gathered numerous screenshots from the game – and it was a deliberate decision to only feature original in-game-art in this collection – and used them on a template made from the official soundtrack cover (#1: Overture: Lore). After narrowing them down to the twenty-four best and most representative covers, I then associated each one with a different track from the official soundtrack album (check out the tracknames in the image captions). Since the tracklist was already in chronological order, I could easily move on to my next step in this devoted endeavor. At some point during this particular collection I thought to myself, why not offer a fully fledged cover set to print and use in a clear jewel case? With the collection above I basically made twenty-four different front covers already. So why not take it to the next level? By clicking the link above you’ll get all twenty-four front covers with matching jewel case inserts, a disc label and even the official booklet, pre-formatted for easy printing (duplex print with short-edge binding, no page scaling). 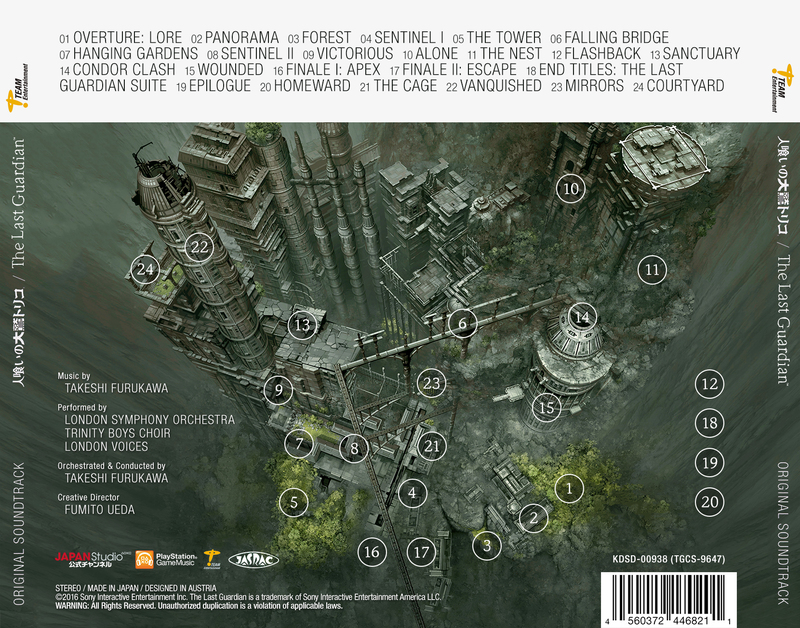 Also included is a special back cover featuring a massive high-resolution map created by a fella named Candykiller. Based on his map and my own playthrough I was able to associate each track with the matching area from the game. It allows you to recollect certain key moments and/or generally enjoy a much more immersive listening experience. Either way, please enjoy this service from me to you. And also make sure to add the digital booklet below to your digital version of the score. My personal conclusion for The Last Guardian reads as follows: It’s the best score Thomas Newman hasn’t written in years. And I don’t mean this negatively, neither for Furukawa, nor for Newman. It’s just that Takeshi Furukawa’s score is really carrying over the musical heritage of Newman’s very own style. It has all the typical ingredients of classic Newman, be it the lush and extravagant strings, rhythmic percussions or the delicate piano themes. All wrapped up in an entirely orchestral environment and Newman’s trademark sound. Scores like these have become a true rarity in this modern day and age, even for Thomas Newman himself. So don’t be a fool and go have a listen on YouTube. Or even better, get yourself a copy. You won’t regret it! As a member of the “Glorious PC Master Race” i don’ have a PlayStation, so this game flew right by me – except for a video here and there. But the music is now definitely on my radar, so thanks for the heads up! But what can i say, other than repeating repeating myself? I guess, that #4/5 combo is a really slick idea – makes me wish i had it in my hands. That TLG monogram (#6) is also very interesting. Thanks, I know I have succeeded if you’re satisfied with the results. Just give me a few minutes and I’ll update the archive with the mockups. I’m glad you commented on my blog so we can discuss future scores in games or whatever other medium that is glorious!